My introduction to the Silver Jews came late with 2005's Tanglewood Numbers, which I listened to incessantly my second year in Brooklyn. The two-and-a-half minute song "Sometimes a Pony Gets Depressed" became an anthem of sorts for 2006. I remember screaming the chorus while counting minutes to the new year at a small party in my falling apart tin-ceiling-in-the-kitchen railroad apartment. I mixed dry gin martinis. After two a.m., the five of us still wanting to celebrate walked down to the local bar, where I ordered another martini, half of which spilled before it got to me. Numbers--with frontman David Berman's wry witticisms and dry delivery of lo-fi rock 'n' country songs as sad as they were blissful--proved an apt soundtrack for a year of decadence, delight, and devastation. Lookout Mountain, Lookout Sea arrived just before I packed up and left the tin-ceilings, 4 a.m. bar close, and G-train behind for the balmy green of the Arkansas Ozarks in summertime. June bugs replaced the bedbugs and the back deck replaced the rooftop. And the songs of Sea fit perfectly with my new environs. A breezy lilt, shimmering guitars, and heavier on the twang, these ten tracks fit right in with these lazy ancient hills, where a pitcher of beer at Maxine's Tap room costs seven dollars and the all-country jukebox plays four songs for a dollar. The sadness is still very much here, but it's conveyed much more through the lyrics and vocal delivery, with the melodies themselves all distilling an air of understated triumph. "Suffering Jukebox" is a prime example, with mellow organ, whimsical guitar, and Cassie Berman blaring the chorus in her trademark off-kilter voice. Beneath the festive veneer are lyrics that tell of a "suffering jukebox in a happy town. You're over in the corner breaking down." 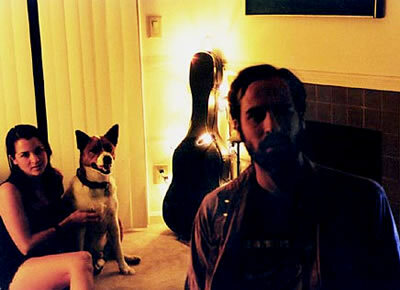 Then there's "Party Barge," perhaps the best indie summer anthem to come along in years. Complete with sound of seagulls, barge whistles, and cow bells, this foot-tapping uptempo gem is insanely catchy and just plain fun. Cassie's vocals have never sounded better than when she sings "send us your coordinates, we'll send a Saint Bernard." There are clunkier moments, as in "Open Field," where David and Cassie sing off pitch for much of the song and the over-the-top happiness just feels wrong for a Silver Jews album. "Candy Jail" is another track that could've been left out. David singing about "living in the candy jail with peppermint bars, peanut brittle bunk beds, and marshmallow walls" comes off as truly hokey rather than signature Berman droll humor. Although Lookout Mountain, Lookout Sea is not a classic like American Water or Tanglewood Numbers, there are several standout tracks that make Sea a delectable summer treat, a perfect soundtrack for grilling out, sipping beers, and watching the fireflies glow.